Ephesians 2:8-9 For it is by grace you have been saved, through faith and this not from yourselves, it is the gift of God not by works, so that no one can boast. The modern evangelical world has a deep focus on grace and faith and a strident opposition to anything that seems like a work of human effort as it relates to the plan of salvation. They say, "It is faith alone that saves us." This "Faith Alone" expression has its roots in a latin phrase popularized by Martin Luther,"Sola Fide," which means, faith alone. Folks can be pretty strong about this position because they have been taught that things like repentance, confession and baptism are works... and the Bible tells us we can not be saved by our good works. I agree, we can not be saved by any good works of merit we perform in order to gain for ourselves access to Heaven. It is the blood of Christ and his sacrifice on the cross which saves us. But, we still must have an appropriate and Biblical response to His sacrifice and invitation. The Sinner's Prayer, as a response to the Gospel, is not in the Bible. Nothing even remotely similar to it can be found in the scriptures. Saying a prayer may seem like the furtherest thing away from a work of merit or a ritual someone would do to be saved, yet my evangelical friends tell me, "If you never said the prayer or invited Jesus into you heart, you could not be saved." In other words, folks who have very deep convictions that we cannot be saved by works, offer a "work..." which is not even in the Bible that I must do to be saved! They tell me, if I do not perform this religious action, I will be lost. The act of "accepting Christ" or saying "The Sinner's Prayer" is the culmination of the evangelical world's plan of salvation. This is a tradition which is well established. Never confuse actions we take based on empty man-made traditions or works of merit with Biblical responses to commands. An appropriate response, a Biblical response to the Gospel includes repentance, confession and baptism. These are biblical things we obey, not acts of merit we perform in order to earn our way into heaven. These are not things man made up. They are right there in your Bible and all of those commands precede the forgiveness of sins. If the Bible commands us to do something, we must do it! We must obey what God says. We must do the will of God. People will speak quiet vehemently about the faith alone doctrine with such passion, you might think that phrase occurs many times in the Bible. In fact, in the entire Bible, the phrase "faith alone" appears only one time. It's in James Chapter 2 and look what it actually says. Wow! This says just the opposite from "Sola Fide." This passage says we are NOT saved by faith alone! God's plan always includes our faith and our responses working together. As I said in the last lesson, this is the definition of true Biblical belief! 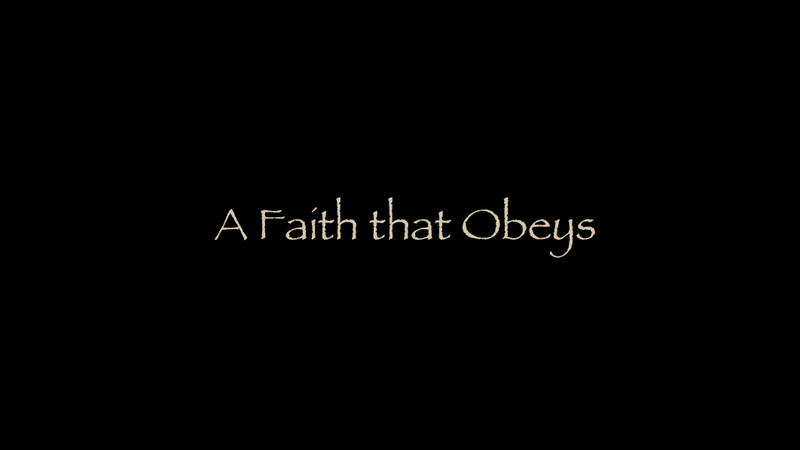 It is very difficult for some folks to accept the fact that obedience is part of the plan of salvation and there is a very important reason why this becomes such a stumbling block. Listen carefully. If you approach this subject with the presupposition that repentance, confession and baptism are works, you'll never be able to see the Biblical Plan of Salvation. You're starting from the wrong starting point! When you understand that confession, repentance and baptism are acts of obedience, in response to Biblical commands, vast sections of the scriptures, which were previously unclear, will make amazing sense! Stop thinking of baptism, confession and repentance as rituals or human works. They are commands of God. Now, if you are still in the "faith only" camp, let me show you a couple of scriptures which will really get you going! Acts 2:40 With many other words he warned them; and he pleaded with them, Save yourselves from this corrupt generation. What is this? How can I save myself? Why would the Bible use this type of language: "Save yourself?" I thought God has made it absolutely clear, there is nothing man can do on his own to get to heaven! Is the Bible contradicting itself? No, of course not. This is obviously one of those instances where the problem is our understanding and not the Bible being inconsistent. The Bible obviously uses the phrase "Save yourself." How is this possible? How can I save myself and not be guilty of some kind of works salvation scheme? That's a huge question and we'll see the answer in just a moment! True Biblical saving faith is like a three legged stool. It includes, grace, faith and obedience. Without question, we see obedience is required before sins are forgiven and we receive the Holy Spirit. For the last five or six centuries, the church has focused almost exclusively on faith and grace to be saved with very little focus on the third and very prominent requirement of Biblical obedience. "You believe that there is one God. Good! Even the demons believe that and shudder." What is the difference between believing demons who are lost and a person who believes and is saved? After all, they both believe in God and Jesus with certainty! One difference is obvious, the demons have never repented! But there is another, more subtle thing they have never done. They have never obeyed the Gospel. They never made Jesus their Lord. This is probably the most crucial thing the evangelical world misses, obedience to Christ. Have you noticed that every salvation passage we have looked at so far contains commands to do something? The Gospel is not something to simply intellectually believe and accept. It must be obeyed. Consider these, very challenging passages, about obedience. Here's the first one. 2Thessalonians 1:8 He will punish those who do not know God and do not obey the gospel of our Lord Jesus. Most evangelicals already agree that if someone does not know God, they will be lost. That's the entire point of evangelism, isn't it... to tell people about Jesus. Few understand or accept and many even outright reject the truth that obedience is also necessary to go to Heaven, but this passage clearly includes both... and both are clearly necessary for salvation. By the way, did you notice the coordinating conjunction, "and?" Here's the next challenging passage about scriptural obedience from Hebrews. Hebrews 5:9 Once made perfect, he became the source of eternal salvation for all who obey him. In Hebrews we see, salvation is given to all who obey him. Notice, this passage says nothing about believing in Jesus. Why not claim, "Oh, look! ALL I need to do is obey! It says nothing about belief in Jesus." I'm of course referencing those passages we looked at earlier which mentioned belief to be saved but nothing about obedience. Do you understand that we must put all of this together? Salvation is a result of our obedience. Finally, we are beginning to narrow down that exact time and place where everything comes together and we are about to see God's word complete it's work when He applies the blood of Christ to our lives. We are about to discover that point in time when we receive the forgiveness of sins, God's Holy Spirit and the gift of eternal life. We are not quite there yet, but let's keep the goal in mind. These three things, the forgiveness of sins, the gift of the Spirit and eternal life are all connected. They do not happen at separate times along our spiritual journey. When we are born again, it is singular event. We don't, receive the forgiveness of sins one day and have God's Holy Spirit indwell us some other day and eventually receive the gift of eternal life sometime down the road. All three things happen at the exact same time." When we reject the fact that one must obey the gospel it might cause us to do some really strange things to support the faith only doctrine. For example, consider John 3:16, pretty much the most famous passage in all of scripture. At first glance, this is another one of those scriptures which seem to suggest that ALL we need to do is believe and we will be saved. Let's read it. Does this scripture say, "ALL" we need to do? No, of course not. So, let's just fix this so it better matches the evangelical world's position. See if you think this would be OK... Check this out. John 3:16 For God so loved the world that he gave his one and only Son, that whoever believes in him without obeying him, shall not perish but have eternal life. When we add the phrase, "without obeying him" it actually becomes a little silly maybe even a little creepy, now that we know that obedience is required as well. Quite clearly, the Gospel is something to be obeyed, not simply believed. And obedience is something you do. Do not make the mistake of confusing acts of obedience with human works of merit or ineffective man made religious rituals like "The Sinner's Prayer." Well! We are still left with that huge question, Why does the Bible tell us to save ourselves? How is it possible to harmonize the idea of saving ourself and that action not being some kind of works salvation which the Bible forbids. How can anyone save themselves?